Wolbachia endosymbionts in the filarial nematode Ochocerca volvulus, the causative agent of River Blindness. Image by Mark Taylor, courtesy of the Encylcopedia of Life under a CC-BY-NC-SA license. Briefly describe the basic biology of Wolbachia. What is meant by an obligate, intracellular symbiont? What are the 4 basic reproductive strategies induced by Wolbachia? Define the 4 reproductive strategies of Wolbachia. Why would Wolbachia induce asexual reproduction in its host? How can we "cure" the host of asexual reproduction? List and describe two major human diseases associated with Wolbachia. 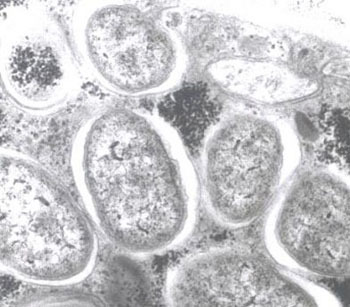 How did researchers confirm that Wolbachia was actually responsible for these diseases? How are they being treated? Adult Black Fly (Simulium yahense) with Onchocerca volvulus emerging from the insect's antenna. The parasite is responsible for the disease known as River Blindness in Africa. Image provided courtesy of the USDA under Public Domain. What is meant by reproduction isolation? How can it lead to speciation? How does Wolbachia influence speciation? 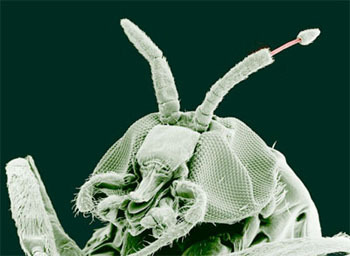 How did researchers confirm that Wolbachia may be responsible for speciation in insects? What is meant by "vector-borne" disease? Name at least two vector-borne diseases. How might vector-borne diseases be controlled using Wolbachia? How might Wolbachia help to prevent the spread of malaria? Describe the structure and infection process of bacteriophage. What is the difference between the lytic and lysogenic lifestyles of bacteriophage? What is the effect of bacteriophage WO-B within Wolbachia? The host insect? How did researchers confirm this relationship? 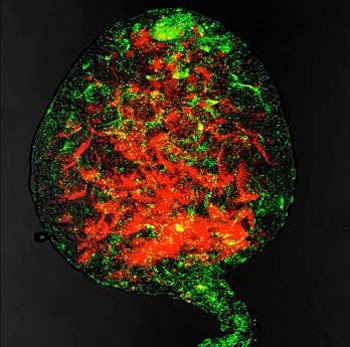 Insect testes showing sperm DNA (red) and Wolbachia endosymbionts (green). Image by Michael Clark and Seth Bordenstein, courtesy of the Encylcopedia of Life under a CC-BY-NC-SA license. Define endosymbiosis. What is the endosymbiotic theory of evolution? What is horizontal gene transfer? How does it relate to Wolbachia?